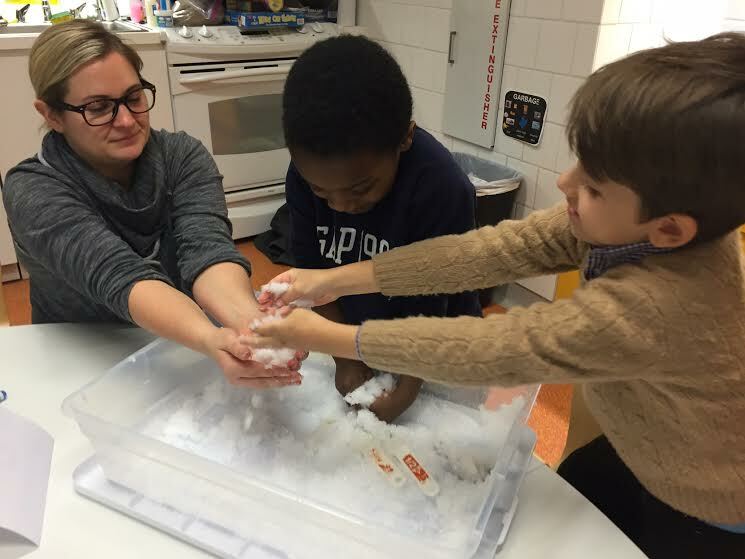 Meeting House - Social Skills – Juniors Update: Let It Snow! Juniors Update: Let It Snow! We had a very busy afternoon with the Juniors today! At first, we introduced our new meeting spots, which we'll use during meetings to make us more aware of our bodies in space. Using these meeting spots and passing around our "meeting ball" really helped us all to give 5 to whoever was speaking. During this meeting, we reviewed our names, went over the schedule and reviewed our "have-to's." During hangout, we had a snack and made snow. Since so many of us were interested in experimenting with the snow we made a "waiting list" and set a timer for each group. This was a helpful, clear way for everyone to be able to wait. We also played with the model magic we had used the week prior. Meghan and I find that if we use materials that we've taught the children how to use, they're more apt to become engaged with them again and are more social with the familiar materials. You can see that the Mitten project we did a few weeks ago is still popular! We also split up the group after a while to work in small groups to play Tenzi, which is a fun, collaborative dice game! After hang out we had a quick meeting where Becky and Mariel modeled using our "have-to's" while introducing the next step of our group activity. The children were very engaged and gave 5 while listening. Before getting to work we had the small groups do a "turn and talk" in order to come up with a "group plan." These "turn and talks" are going very well, and are a nice transition into group work. We put a lot of hard work into these villages! While working some of us would get frustrated if something didn't look perfect, or turn out the way they'd wanted. At first we figured out if it was a "small problem or a big problem," and then found a solution. We also had some accidental bumping happen today and we helped the children by structuring these interactions. We gave language, "are you ok?" and "it was an accident." Since we finished a little early we had time to play Kids on Stage. The group loves this game, and some get frustrated when they don't win a card. Again, we discuss the size of the problem and what is "expected behavior" when we play a game. It was a great week. We covered a lot of issues while playing which is a practical way to teach social skills and pragmatic language. Have a great week, we'll see everyone on Wednesday for the filming of our snowman movie!! It's called the Snowman and even though it doesn't have any talking, we can understand how the friends are feeling and what they're doing! Enjoy! The Importance of "Free Play"